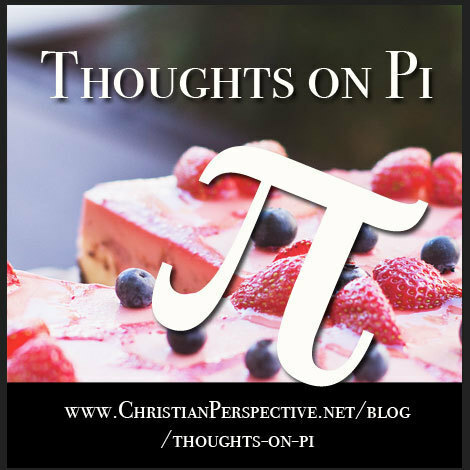 Someone recently wrote and asked me if I had any information on pi from a Christian perspective I could share. So here are some thoughts on this mind-boggling–and incredibly useful–number. As this definition explains, pi is a transcendental–a number that keeps going on and on. To get a better feel, take a quick look at the first 100,000 digits of pi–it’s a mind-boggling number! Has Pi Always Been Expressed the Way It Is Today? Hardly! The symbol π is just a symbol man chose to help express that real-life ratio–the symbol has actually been used to mean other things! Like most math symbols, it has been adopted within the last several hundred years . Throughout history, men have tried to more precisely define pi. I found it fascinating to read in π: A Biography of the World’s Most Mysterious Number that, when you really dig into the text, it appears the Bible accurately uses pi to the fourth decimal place (1 Kings 7:23)—the book concluded that ”such accuracy is quite astonishing for ancient times.”  Not surprising considering the Bible’s Author! Where Do We Use Pi? Pi has a way of showing up all over the place–a testimony to the same Creator holding all things together. The most obvious use is when dealing with circles (for example, pi is used to find the area and circumference of a circle), but pi also proves useful in less-obvious places, such as in sound waves, general relativity, movements of the heavens, and probability, to name a few. 2018 Update: NASA has put together a Pi Day Challenge that shows just how useful pi is! Note that NASA does not come from a biblical worldview, so please use discernment (while most problems looked great, one at least hinted at finding life on other planets). Why Are We Able to Explore Pi? Because God created man in His image and gave him the ability to explore His creation! We’re thus accountable to Him for how we use that ability. There are lots of materials online that share more about pi (you might start with Wikipedia’s overview or this historical overview of pi). Your library may also have some books that could prove helpful. One I particularly enjoyed is π: A Biography of the World’s Most Mysterious Number by Alfred S. Posamentier and Ingmar Lehmanne. The thing to keep in mind is to turn the wonder at pi itself into wonder at the Creator of all things–the one who understands what only baffles our comprehension. Loop, Katherine, Revealing Arithmetic: Math Concepts from a Biblical Worldview (Fairfax, VA: Christian Perspective, 2009), p. 125. Internal quote from James D. Nickel, Rudiments of Arithmetic: Foundational Principles in the Computation and Theory of Numbers, 1st ed. (preliminary draft) (U.S.: James D. Nickel, 2008), p. 294. Posamentier, Alfred S. and Ingmar Lehmann, π: A Biography of the World’s Most Mysterious Number (Amherst, New York: Prometheus Books, 2004), p. 13. It was “introduced in 1706.” Cajori, Florian, A History of Mathematical Notations: Two Volumes Bound As One (Mineola, NY: Dover Publications, 1993), vol. 2, p. 9. Posamentier, Alfred S. and Ingmar Lehmann, π: A Biography of the World’s Most Mysterious Number (Amherst, New York: Prometheus Books, 2004), p. 28. “There is almost a cult like following that has arisen over the concept of π.” Ibid., p. 13. I just read an interesting book on Pi called The Joy of Pi. It gave an in-depth history of the number, listed those who have attempted to solve its mystery and the way it came to be the symbol and number value we know today. You may also check out their website, http://www.joyofpi.com/, where you can find Pi facts and links to other information about Pi. Thanks for posting this–I have read that book too, and it has some interesting facts. I found this quite interesting. Thank you for posting it. By the way, most people use 22/7 as a good rational approximation of pi, but a much more precise one is 355/113.